As I stumbled over pronouncing his name Ala’a Jarban, the studious young man I interviewed smiled and said, “ you can call me AJ, everyone does. ” I had read several articles about him and life in his native country of Yemen that compelled him to seek asylum in Canada. What led him to be passionate about universal human rights? AJ grew up feeling different, like an outsider. His skin was darker than most Yemeni people because his family’s origin was Ethiopia. With three sisters, he learned early on the injustices and restrictions Yemeni society placed on them. His older sister started working for the United Nations, and he learned about human rights through her. He read books on the subject and wondered what he could do to help make a positive change in his country. AJ started blogging while a student at Sana’a University in the capital of Yemen. Blogging can have a strong effect on both the writer and the reader. As a strategy for social media, it can impact a few individuals or thousands. Life was hard for the students as jobs were scarce, but with the advantage of knowing English, AJ found work. When he blogged, he did it in English rather than his native Arabic. Circumstances in Yemen led AJ and his fellow students to want a more democratic government and they started to talk about the need for change. Their whole lives were spent under a president who had ruled for 33 years. The students were connected through the Internet and knew what was going on around the world. AJ was also connected to many human rights groups and international organizations, including the United Nations and Equitas in Canada. He knew of the pressure to make change in other Middle Eastern countries as well. Social media had come of age and AJ saw it as an opportunity to promote change for a better Yemen and a better world. AJ started protesting weekly on the Internet and on Facebook. Other students joined with him. More and more students were making their voices heard. AJ continued blogging about universal human rights. A breakthrough came when a National Dialogue Conference was put together for activist groups and other government parties to write a new constitution for Yemen. A number of activists brought up LGBTQI (Lesbian, Gay, Bisexual, Transgender, Queer and Intersex) rights in Yemen, one of ten countries to penalize and criminalize homosexuality with the death penalty. However, talk of human rights for LGBTQI individuals did not go well despite the presence of human rights groups at the conference. Frustrated, AJ decided to blog about the issue, stating that he too, was a member of this minority community. Since he blogged in English, some of his supporters sent words of encouragement to him. In 2013, AJ came to Montreal to attend Equitas’ International Human Rights Training Program (IHRTP). While in Canada, his blog post went viral. A firestorm of hatred was the response. AJ’s blog was translated into Arabic using inflammatory phrases. He started to get threats on his life. Still, other students asked AJ to post their stories anonymously on his blog, which he did. Having more stories come out was huge. It began to change the dialogue that families and siblings were having. It was no longer just a “ Western phenomenon ” to be denied. AJ sought asylum while in Montreal due to the escalating threats on his life. He was accepted as a refugee and was never able to go back home to Yemen. 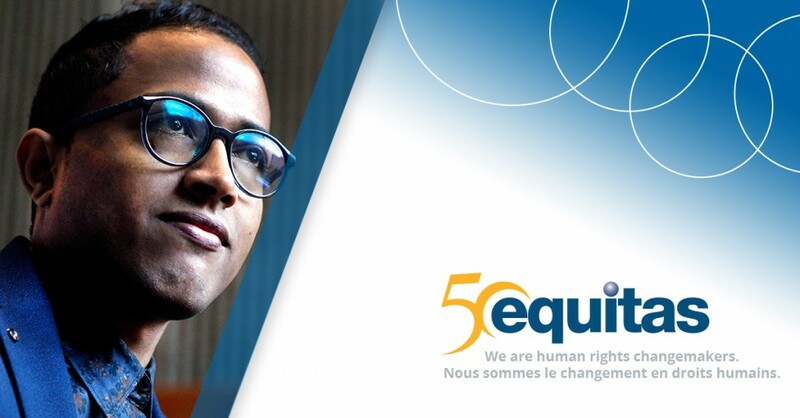 Now redoing his undergraduate degree in Canada, AJ continues to work with Equitas to bring attention to universal human rights, the rights of refugees, and the rights of LGBTQI people in Yemen and around the world. Although Yemen is experiencing a civil war, AJ says there are important key players and allies in Yemen with hundreds – if not thousands – of civil society members still working to bring about equality for all people. And the support of organizations around the world that donate money to civil organizations in Yemen helps them to do life-affirming work.